Noble Christmas music by a son of Bach: these world-premiere recordings of works by C. P. E. Bach represent two different periods of his career. 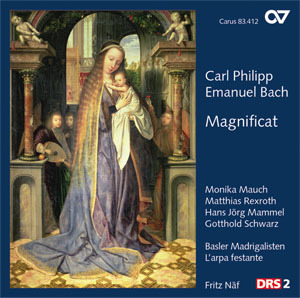 Throughout his whole life C. P. E. Bach regarded the 1749 Leipzig early version of his Magnificat as one of his most important works. It contains all the elements which aesthetics of the time demanded of a large-sclae sacred composition: nobility, dignity, polyphonic and concertante choruses, deeply-felt arias, and a great concluding double fugue. The festive music Die Himmel erzählen die Ehre Gottes was written during Bach’s later years as director of music in Hamburg. The Basler Madrigalisten, L’arpa festante and well-known soloists, under the direction of Fritz Näf, give a commanding and enthralling interpretation of these works by C. P. E. Bach.